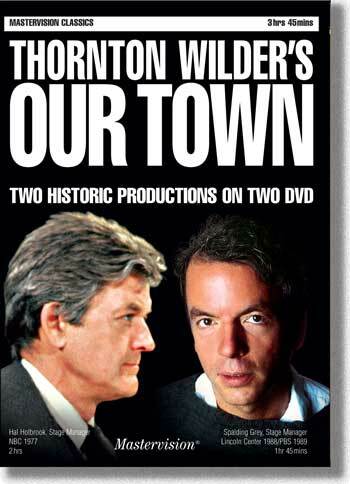 Thornton Wilder was unhappy with the 1940 film and 1957 musical versions of Our Town. Before his death, in 1975, he worked with producer Saul Jaffe and director George Schaefer in an attempt to leave behind a definitive version of his masterpiece. The result of that collaboration was broadcast on NBC in 1977, featuring a stellar cast that included Hal Holbrook, Ned Beatty, Sada Thompson, John Houseman, Glynnis O’Connor and Robby Benson, and was such a success that the trustees of Wilder’s estate decided to never permit another television version of the play. The author had his definitive version. Since its original production in 1938, Our Town has been produced on stage somewhere every single day, often by school or community theaters drawn to its simple set design, large cast and American themes. Gregory Mosher, who directed the Lincoln Center Theater’s stage production, felt that as a result the play had been turned “into a holiday greeting card, reduced by a consensus that it was a superficial, nostalgic, flag-waving poem to a lost America.” His production reflect’s Wilder’s “very particular version of what life in this century had been and might become.” The production, featuring Spalding Gray, Frances Conroy, Roberta Maxwell, Penelope Ann Miller and Eric Stoltz, ran on Broadway for 136 performances, and the trustees were so impressed by the Tony Award-winning production that in 1989 they granted permission for its presentation on PBS’s Great Performances series. The 1988 production is the one recommended by the Thornton Wilder Society. Read why here. Our Town is considered one of the greatest American plays. Epic in scope yet profoundly intimate in its depiction of small town life early in the twentieth century, Wilder’s aim was to leave a time capsule for future generations curious about life in early 20th century New England. Upon his death he could not have known that his desire for a definitive television production of his play would be satisfied not once but twice. It’s hard to imagine he wouldn’t have been pleased.